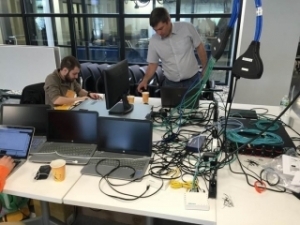 Cambridge, May 16-20, 2016 – SDN/NFV solution provider Brain4Net Inc. announced its B4N Controller, MEF apps pack and B4N SwitchOS have successfully passed interoperability tests with Noviflow and Edge-Core switches. This results were achieved at the 2nd annual Open Networking Foundation (ONF) AppFest 2016. 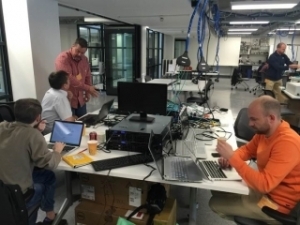 AppFest 2016 took place at the University of New Hampshire InterOperability Laboratory from May 16-19. The annual event is an excellent opportunity for developers and vendors to verify interoperation of their applications, controllers, switches, and test tools. Approximately 50 organizations participated, testing their solutions for interoperability and conformance with the OpenFlow 1.3 specification and other protocols. Brain4Net Inc., a promising SDN/NFV startup headquartered in Cambridge, MA, was a first-time participant in the event. Company’s B4N Controller and MEF apps were tested for compatibility with Noviflow and Edge-Core switches in order to ensure seamless interaction before running them in a production environment. The B4N Controller was also verified for ONF Controller Benchmarking on IXIA hardware, and tested with Spirent’s Test Plan for switches and hosts topology emulation and performance. Meanwhile, B4N SwitchOS was successfully tested for interoperability with IXIA and Spirent test systems, and underwent an ONF Conformance Test local run using IOL services. Brain4Net Inc. is an innovative SDN/NFV solution provider for Enterprises and Service Providers. The B4N Service Platform provides a comprehensive network orchestration & control solution for multi-vendor network infrastructure. The firm’s approach helps organizations bring agility to the network, improve network service chaining, and reduce both CAPEX and OPEX for network infrastructure deployment and operations. Founded in 2011 by Deutsche Telekom, Facebook, Google, Microsoft, Verizon and Yahoo!, the Open Networking Foundation (ONF) is dedicated to accelerating the adoption of open Software-Defined Networking (SDN) worldwide through open standards, market education, and software development. Our signature accomplishment to date is introducing the OpenFlow™ Standard, which enables remote programming of the forwarding plane. The OpenFlow Standard is the first open, vendor-neutral SDN standard and a vital element of an open SDN architecture. Today, ONF’s 150 member companies and 3,000 volunteers advance all aspects of SDN, fostering a vibrant market of products, services, applications, customers, and users.